Just across the Lions Gate Bridge from downtown Vancouver lies the North Shore, a scenic area made up of North Vancouver and West Vancouver and the North Shore mountains. Few people in North America can live in a city and be this close to the wilderness. This area is a dog, people and mountain bike paradise. Beware if you bring your dog here because he or she may refuse to go home. There are hundreds of miles of trails and innumerable creeks and rivers and trees and lush vegetation. There are few places in the world more wonderful. Here is a small sample of some of the great places to hike on the North Shore. Lighthouse Park is a magnificent 184-acre stand of virgin forests and ocean cliffs. To get there, cross the Lions Gate Bridge and go toward West Vancouver. You will be on Marine Drive. Continue west on Marine Drive for six kilometres and watch for the one sign to Lighthouse Park on your left hand side. There is plenty of parking at the park entrance. You’ll find maps and a number of trails, some of which lead to the rocks and the beach. If you take the main trail, you’ll discover the Point Atkinson Lighthouse, a working lighthouse. To reach Cypress Falls trail, take Highway #1 west to the Caulfeild exit. Once you exit the highway, turn right at the s sign and follow the road as it curves to the left and into a neighborhood. You’ll be on Woodgreen Drive. At Woodgreen Place, just a couple of short blocks along Woodgreen Drive, turn right and follow the road into a small parking lot, just above a baseball diamond. Park and walk east from the parking lot into the woods. Pick up the trail and go left, away from the baseball diamond. You’ll walk parallel to Cypress Canyon but you won’t be able to see it. Keep walking until the trail goes right and winds down to Cypress Creek. Cypress Falls is just below the bridge. You can cross the bridge and follow the trail up to a utility road or you can go up the hill from the bridge, staying on the west side of the creek, and follow a trail that parallels the creek and gives many spectacular views of more falls and pools. To get there, cross the Lions Gate Bridge and go toward West Vancouver. You will be on Marine Drive. Continue west on Marine Drive to 13th Avenue. Turn south, left at 13th and go one block to Ambleside Park which has, besides a great dog park, a beach, a magnificent view of Vancouver, playing fields, pitch and putt golf, a snack shop, skateboard park, and a pond. To get to Lynn Headwaters, cross the Lions Gate Bridge, turn right at the end of the bridge into North Vancouver and then turn left at Capilano Road. Follow Capilano Road up to the intersection with Highway #1. Take the sign that says Route 1 East. Stay on the Highway until you reach the Lynn Valley exit, about 3 kilometres. Exit the highway and turn right at the signal onto Lynn Valley Road. Stay on Lynn Valley Road until it dead ends at Lynn Headwaters Regional Park. The first thing to pay attention to in this park is Lynn Creek itself. It may well be the most beautiful creek on the North Shore. Everything about it from the color of the water to the size of the boulders and its surroundings make it magnificent. After you’ve admired the creek, cross the bridge and have a look at the map posted at the trailhead. It will give you some idea of your options. One very nice hike parallels the creek and follows it upstream. Check the map and you’ll see that you can either walk for a way along this trail then retrace your steps back to the parking lot or you can choose from a couple of loops. You can find Lynn Canyon Park by following the same route you take to get to Lynn Headwaters; however, don’t drive to the end of Lynn Valley Road. Instead, go along Lynn Valley Road only as far as Peters Street. It goes off to the right as you’re driving north. 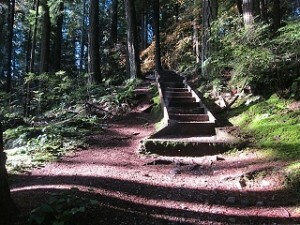 Take Peters Street to the end and watch for signs that lead you to Lynn Canyon Park. Once you’ve parked the car, you can cross the amazing Lynn Canyon Suspension Bridge, or avoid it if you are squeamish about such things. The alternate route is about 100 yards downstream from the bridge. There are miles of trails to explore in this park and some excellent swimming holes if you visit in summer and enjoy cold water. There are lots of squirrels in the parking lot here so it’s a good idea to leash your dog before you get out of the car. There are many trailheads along Cypress Road and many others once you reach Cypress Provincial Park, 9km from the junction of Cypress Road and Highway#1. To reach Cypress Rd, take Highway #1 west to the Cypress Road exit and follow the road up into the mountains. Actually, there are several trails that go off from here. The gravel trail that leads down to the right goes all the way to the 21st Avenue exit off the Highway in West Vancouver. But the trail you want goes off to the left and through a gate in a black cyclone fence. You can follow that trail as it traverses the mountain and comes out in a posh West Vancouver neighborhood after about half an hour’s walk. This trail starts out with some steep parts but soon levels off and is flat the rest of the way. Along the way, you’ll cross many beautiful creeks. To get to North Vancouver, cross the Lions Gate Bridge and go right toward North Vancouver. Capilano Road, just east of the Lions Gate Bridge exit, provides access to several trails. If you go north on Capilano Road, you’ll pass Capilano Regional Park with its extensive network of trails, Cleveland Dam with trails that connect with those of Capilano Park. 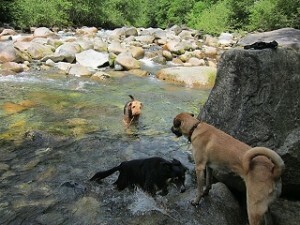 Two great dog walks follow Mosquito Creek. To get to either, cross Lions Gate Bridge, turn right at the end of the bridge into North Vancouver and then turn left at Capilano Road. Follow Capilano Road up to the intersection with Highway #1. Follow the sign that says Route1 East. Stay on the Highway to the next exit, Westview. Exit the highway and turn left at the signal at the of the ramp. Follow Westview to Queens Road, about .5 km., and turn left onto Queens Road. Pass the Griffin RecCentre on your left, and just past the RecCentre, turn left onto the road that leads to a lower parking lot. Follow the road past the parking lot to where it ends and park your car. Pass the barriers, and cross the bridge on your right. Follow the trail as it bends to the left. After a short distance it will come to the creek and then will parallel the creek for about 2 km. To get to the upper Mosquito Creek trail, follow the directions to Westview, but instead of turning at Queens Road, continue up Westview to Evergreen. Turn left on Evergreen and follow it as it skirts the tiny Delbrook Plaza mall. Find a place to park near the end of the road. It’s only about 100 meters long. You’ll see a set of stairs that leads down to the creek and a bridge that crosses the creek. Cross the bridge and turn right. The trail, very popular with both dogs and their companions, goes north for about 2 km. To get to the West Powerline trail, follow the directions for Mosquito Creek. However, instead of turning at Evergreen, stay on Delbrook (Westview becomes Delbrook after Queens Road) and follow it as it winds north to Montroyal Road. Turn left on Montroyal and follow it past the firehouse and across Mosquito Creek. At the next intersection, turn right onto Skyline Drive and follow Skyline up to the . Be careful because about three blocks above Montroyal, Skyline turns sharply to the right. Park your car near the orange gate on your left at the beginning of the trail. The Powerline trail goes west from the gate about 2 km to the bottom of the Grouse Mountain Skyride. It’s another popular local dog walk with several creeks and streams, some good city views and a beautiful little bridge. Seymour River trail begins at the end of Riverside Drive. To get to Riverside Drive, go east along highway 1 and exit at the Mt Seymour Parkway. Follow the signs onto Mt Seymour Parkway. Go along Mt Seymour Parkway to Riverside Drive and turn left onto Riverside Drive, which parallels the Seymour River. Follow the road to the end. If you visit in the summer, you won’t be able to park at the end of the road, but you might way to drive to the end of the road so you know where you’ll be going before you backtrack and find a place to park. This trail, that goes for miles into the forest, is popular with mountain bikers who are generally very courteous and always on the lookout for people and animals. It’s a good idea to reciprocate by watching for bikes and holding your dog when bikes pass you.